We are just under six months out from the wedding, and our wedding website is live! Check us out at caitlinandjason.com! 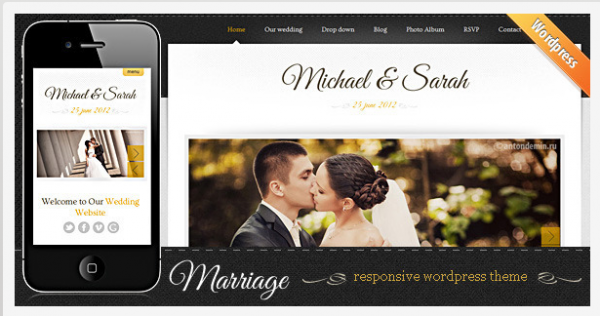 Our wedding website runs on Wordpress using the Marriage Theme responsive theme from Themeforest. This theme has a built in homepage slider, color customization options, customizable homepage with easy to update widgets, and a built in photo gallery. 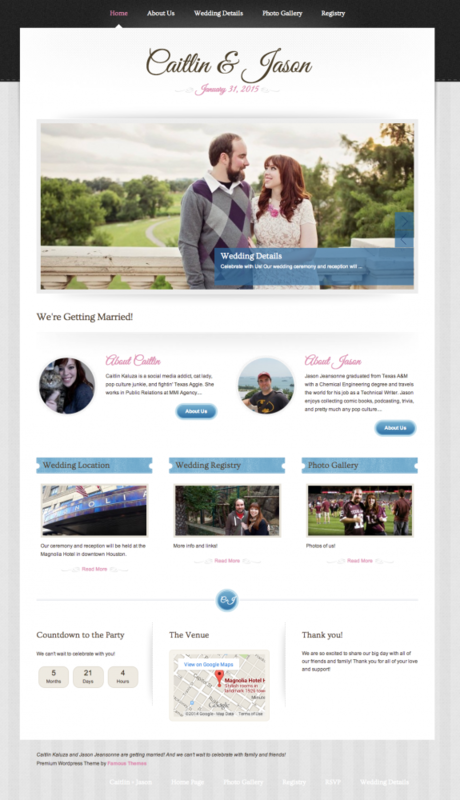 The Marriage Theme is built with a CSS template that works with Visual Form Builder Pro. That plugin costs $20. 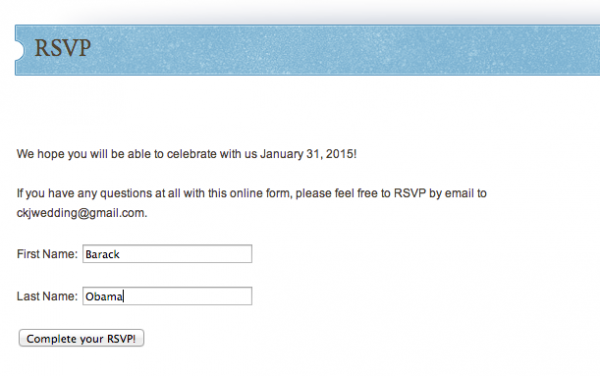 For our website, I went with the free plugin called RSVP Plugin. 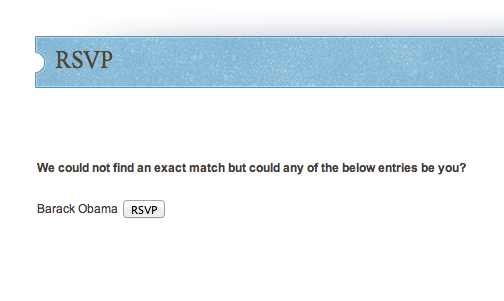 I like RSVP Plugin because guests can’t RSVP anonymously (so random users or bots can’t inadvertently mess up your RSVP list by registering people who aren’t actually on your invite list). You have a few different options for how they identify themselves: you can set up a special code, or have people identify themselves by first and last name to register (this is what I chose). In this scenario, you import or manually add guests to your database. You also associate guests with each other (i.e. Mr. and Mrs. Smith), which allows guests to RSVP for their whole party/family. There are tons of customization options – you can customize the response form to add additional questions, and even customized messages to individual guests. 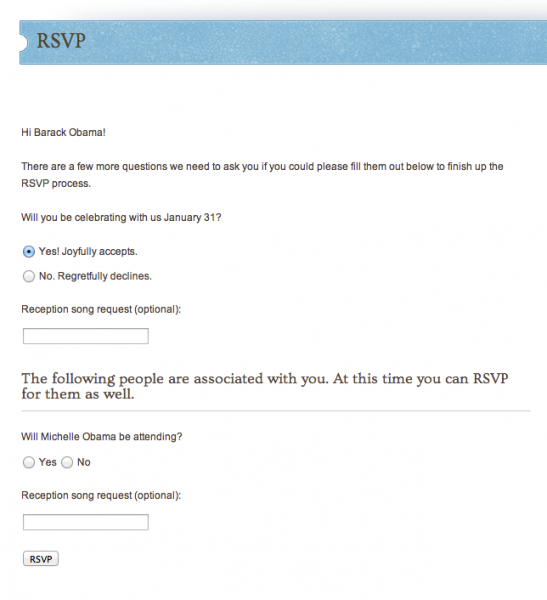 We added a song request field for the reception. And then when they click “Complete your RSVP!” they see more options and the ability to RSVP for every other guest associated with them. All of this text is customizable. P.S. I will be adding the Obamas to my invitation list. Apparently, if you send the President and First Lady a wedding invitation, they will send you a congratulatory letter! Here is a list of famous people who will send you a congratulatory letter if you send them a wedding invitation to consider adding to your invitation list! All in all I’ve been really happy with the WordPress theme and plugins I’m using for the site. Feel free to share your wedding website tips in the comments below! Great Free WordPress Mobile Theme – Wapple! Royal blue and yellow sounds lovely. A purple and yellow would also be very spring orientated. Even a white and yellow, I've seen several weddings where one of the main colors is white coupled with a brighter color and it looks lovely. Best way to pick colors etc is to talk to the venue where your having your wedding. You could find royal blue or yellow won't look right at the venue. As for flowers I'd talk to a florist once you've picked your colors- they can let you know what's in season around the time of your wedding in the colors you want. Best wishes! The effect that you have put to design these themes are showing in its screenshot. The color combination is really awesome. This is the second website who's color combination i like the most, the first one is Work Sole http://www.worksole.com/ . The most important thing is that we can find out hundreds of sources which provides its tutorials, by reading them we can solve most of the problems which we face. Apart from the system is available to users free of charge, more punctually updated . Not everyone paid product can boast! Constantly added something new, corrected security threats.The list goes on and on, I just singled out for themselves the main advantages of the WordPress.